Dance into 2012 with the vivacious and appealing Pantone Colour of the Year, Pantone 17-1463 Tangerine Tango. Tangerine Tango is a spirited reddish orange that provides the energy boost we need to recharge and move forward. Sophisticated, but at the same time seductive, Pantone 17-1463 is an orange with a lot of depth. Reminiscent of the radiance of a sunset, Tangerine Tango marries the vivaciousness of red with the friendliness of yellow, to form a magnetic hue that emanates heat and energy. Energise interior spaces with Tangerine Tango home accessories and this high-impact hue will add spice to any room. The use of Pantone Tangerine Tango can be an inexpensive way to perk up your home, whilst painting a wall with the shade can offer a dynamic burst of energy in the kitchen, entryway or hall. 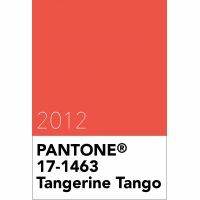 Pantone 17-1463 Tangerine Tango is from the Pantone Fashion, Home + Interiors colour library.